Some music fans will do anything for that perfect pair of concert tickets — even if that means offering to donate a cart of groceries. An odd request to be sure, but it was one BX93 morning hosts Dave, Rachel and Forman weren’t about to pass up. One cart turned into two, and the crew headed to No Frills, itching to load up on breakfast essentials destined to help out a local school program through the London Food Bank. Three years later, the team is ready to take it to the next level with Dave & Rachel’s Breakfast Thing, kicking off at the Tourism London Information Centre Tuesday, Sept. 18. — collecting breakfast food donations for kids in need. Broadcasting live, alongside special guest and Canadian country heavyweight Tim Hicks (from 8 a.m. to 10 a.m.), the team will be ready to accept everything from low-sugar boxed cereal and oatmeal, to perishable items like fruit and veggies, as well as cash donations. Basically, those wishing to contribute can drive thru and drop off — it’s just that easy. As far as getting Hicks involved, credit goes straight to Forman. 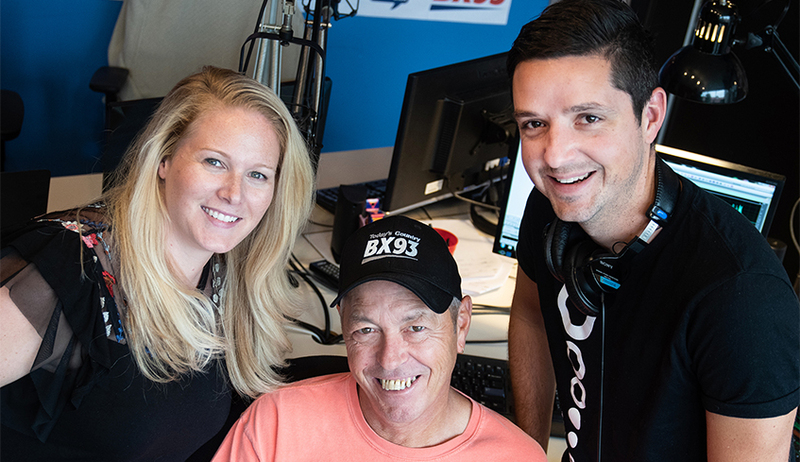 BX93 is no stranger to charitable causes — the station’s annual Christmas toy drive has become a staple in London over the years — but rather than just make the breakfast collection a one-time thing, the trio is hoping to keep breakfast collections going throughout the year. Really, the new project is the culmination of several years of planning, and a lot of personal passion. Dave & Rachel’s Breakfast Thing will kick off Tuesday, Sept. 18. Donations will be accepted at the Tourism London Information Centre (696 Wellington Rd. S.) from 8 a.m. to 10 a.m.
For more information, specific donation requests, or to contact the station about a pick up or drop off, visit www.iheartradio.ca/bx93/more/breakfast-thing.